Since ex-Egyptian President Mohamad Morsi was deposed from power in July, 2013, there has been increasing violence targeted against Egypt's eight million Coptic minority. 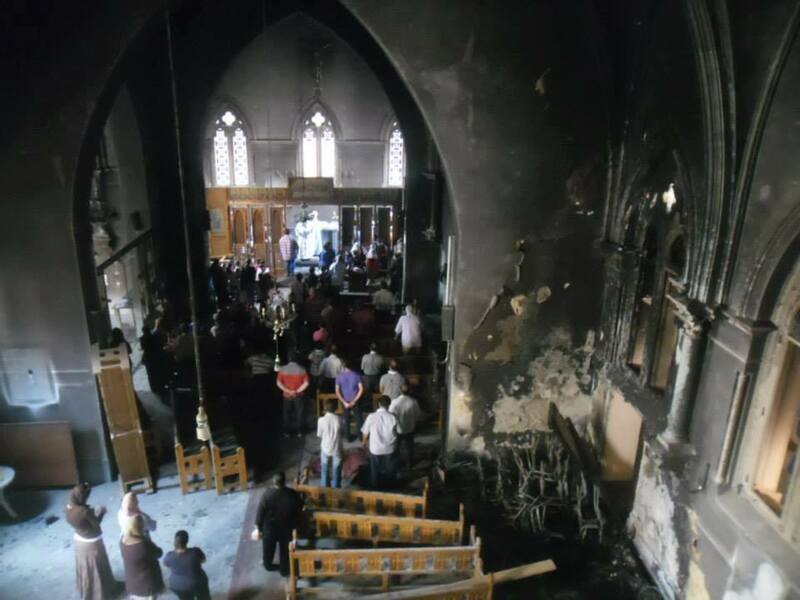 In the past fortnight, 58 Christian Churches (14 of them Catholic) throughout Egypt. Aside from torching these churches, agitated Islamists also paraded three Franciscan nuns through the streets like prisoners of war before a Muslim woman gave them refuge. Alas, two other women working at the school were sexually harassed as they fought to get through the mob. When an Obama Administration spokesman was asked about whether the violence in Egypt crossed a red line on the Obama Doctrine's "Duty to Protect", the White House flack chose to make a snarky comeback. Fortunately, not everyone took the Muslim Brotherhood inspired attacks against the Copts and other Egyptian Christians as a laughing matter. 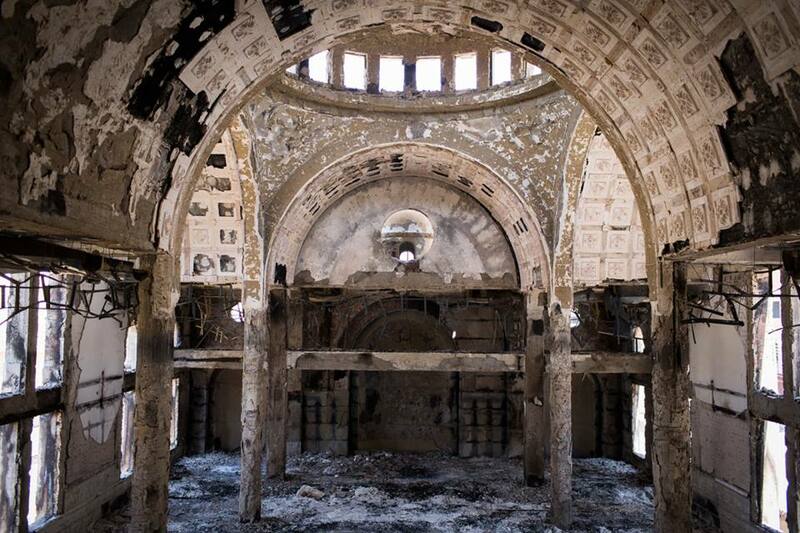 The Catholic Bishops in Egypt released a statement: "This is not a civil war between Christians and Muslims. It is not a civil war but a war against terrorism. And the majority of the population is against terrorism and religious extremism." Due to the threats of violence, the Coptic Virgin Mary and Priest Ibram Monasteryi in Degla, Upper Egypt, did not celebrate Divine Liturgy for the first time in 1600 years. But Fr. James Martin, S.J. posted an inspiring photo on his Facebook account which showed the faithful celebrating Mass in a burnt out church. While people may hold different religious tenants and express their faithfulness in different ways, this site celebrates religious freedom and the freedom of conscience. These attacks seem to be targeted against Christian faithful in Egypt, which predates the introduction of Islam. The Muslim Brotherhood may be using the unrest as a means to impose shariah upon Egypt, which is contrary to Egypt's history. Although it is not my creed, count me as a Copt to standing up for their faith and supporting the freedom in conscience throughout the world. 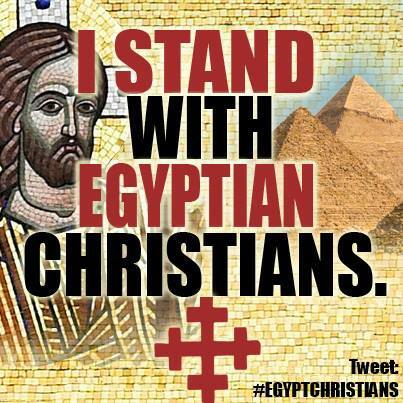 There is a campaign to show support for beleaguered Christian believers in Egypt with the #iamcoptic campaign. This is not like the trend in the Nineties to show how much you care by wearing ribbons. This is to recognize that the Islamist persecutions of Copts in Egypt may represent a Christian Krystallnact in 1938 when Nazi Germany ramped up persecution of their Jewish scapegoat minority before embarking on their diabolic final solution of the Holocaust. By What Are YOU Called?